Escape the cold and join Montcycling for a weekend away in Gold Coast Hinterland this August. 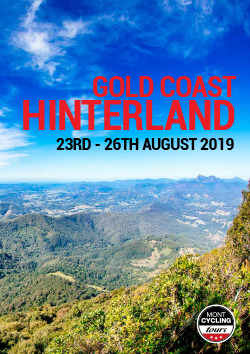 Enjoy the subtropical climate, fabulous mountains and three unforgettable days of cycling through the lush Hinterlands of the beautiful Gold Coast. Our weekend is based in the hills, 30mins drive from the Gold Coast Airport, in our own private luxury oasis. You will eat fabulous food each day prepared by chef and good friend of Montcycling, Dave “Aussie” Ballish. Aussie has been a chef and restauranteur for over 35 years and we are always very excited to have him as part of the team in QLD. $1750.00 Per Person | Click here to download your booking form and secure your position today. • On bike nutrition – fruit, cake, lollies, water etc.